Vitamin B1 (Thiamine) is an essential coenzyme for carbohydrate metabolism. It is essential for healthy nervous system, muscle tone, normal digestion and energy. 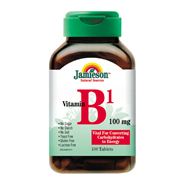 Each tablet contains: Vitamin B1 (Thiamine Mononitrate) 100mg.